3 Suicide Bombers In Istanbul Attack Were Reportedly Russian, Uzbek, Kyrgyz : The Two-Way A senior Turkish official identified the attackers' nationalities, according to the Dogan News Agency. Police have carried out raids looking for suspects in the attack that killed more than 40 people. Bullet impacts are pictured at Istanbul's Ataturk airport on Wednesday, a day after a suicide bombing and gun attack killed more than 40 people. The three suicide bombers who carried out Tuesday's deadly attack on an international airport in Istanbul were Russian, Uzbek and Kyrgyz, a senior Turkish official says, according to a report by the Dogan News Agency. The death toll in the triple suicide bombing and shooting attack has risen to at least 44, Turkish state-run media announced Thursday. More than 200 people were injured. The attack has not been claimed by any organization, but Turkish authorities say they suspect the Islamic State was behind it. Turkish police have also detained 13 suspects, three of them foreigners, in connection with the attack, NPR's Leila Fadel reports. 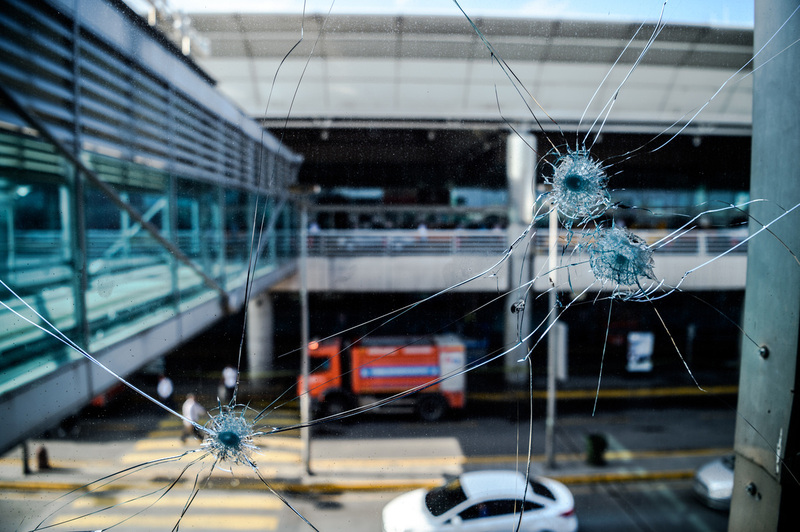 Raids across the country have been seeking anyone involved in the strike at Ataturk international airport, which is Europe's third-busiest airport. Authorities in Turkey have been trying to crack down on ISIS activity in the country for a while, Dalia Mortada reports for NPR from Istanbul. "ISIS recruitment in Turkey has been an ongoing issue in recent years, with reports of youth being radicalized in neighborhoods in Istanbul, Ankara and beyond," she says. "Turkey's border with Syria is 500 miles long and difficult to keep secure, making it relatively easy for militants to cross in and out of Syria," Mortada says. Tuesday's attack is the fifth in Turkey to be pinned on the Islamic State since last July, she notes. The Associated Press notes that leaders in Turkey have said that "all information suggests the attack was the work of IS, which this week boasted to have cells in Turkey, among other countries." "There was no immediate claim of responsibility by the militant group, which used Turkey as a crossing point to establish itself in neighboring Syria and Iraq," the wire service writes. "The group has repeatedly threatened Turkey in its propaganda publications."